While most people’s dreams of prolonging the life of Breaking Bad are limited to the whimsical fantasies of Britney Spears and articles that just keep mentioning it, again and again, even though it ended well over a week ago, and it’s like get over it, you’re just using it as clickbait at this point, and even winking at that doesn’t excuse it, most people are not multimillionaire media moguls with money to burn. But while Jeffrey Katzenberg definitely is that, it turns out not even throwing his power or kindling money at Vince Gilligan and Co. was enough to get him more of the show, as Variety reports that Katzenberg offered them $75 million to give him just one last fix of 180 minutes. (And then he’s done, he swears). Katzenberg made the revelation to the Mipcom conference, during a speech that, like all human dialogue, eventually drifted to Breaking Bad. “I had this crazy idea. I was nuts for the show. I had no idea where this season was going,” Katzenberg said in explaining his request for a continuation in 30 six-minute installments that would be spread over a month—giving those who complained about the final season being split something to really cry about, but also giving us 30 more precious days before we’d have to find something else to discuss. Calling it the “best pay-per-view scripted event ever,” Katzenberg said each episode would have cost between 50 and 99 cents to watch, eventually earning the production team a greater profit than they’d seen over the entire run of the series, which would presumably make up for all the ways in which it would frustrate their fan base. 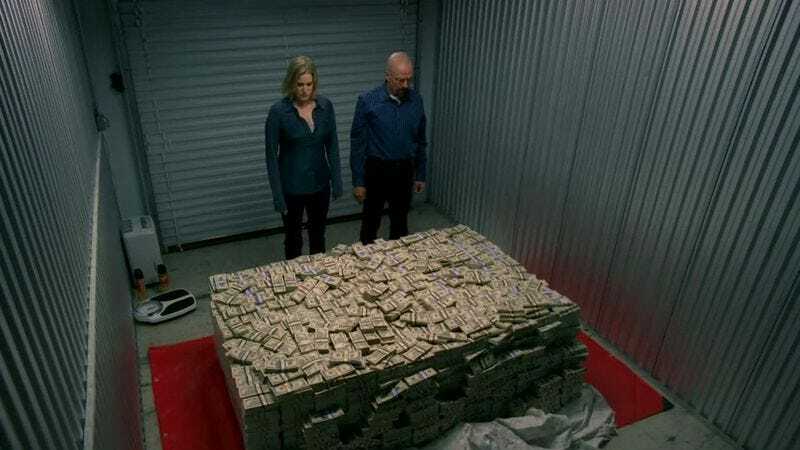 Of course, unlike its protagonist, not even the promise of more money was enough to keep Breaking Bad going far beyond the point of reason and hurt the ones who loved it—and even Katzenberg admitted that the series finale pretty much nullified his idea anyway. Then again, so long as Katzenberg is just throwing his millions around, we’re pretty sure the guy who played Huell would be willing to come to a motel room for six minutes, no questions asked.